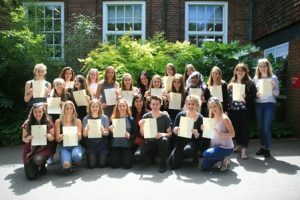 The Institute of Education (IoE) at the University of Reading is celebrating a successful research year with its annual Postgraduate Conference entitled “Knowledge is Power” on Wednesday, 28th June 2017. 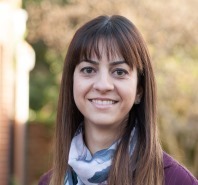 The conference is organised by the IoE’s Doctoral Researchers Conference Committee, supervised by Dr Maria Kambouri-Danos, Deputy Director for Postgraduate Research Studies. 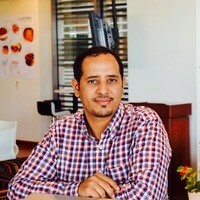 The main speaker at the conference is Dr Khalid Alshahrani (left), whose leadership in the field of technology in education has seen his work published extensively and contributes to his position as Academic Relations Lead at the King Abdullah University of Science and Technology in Saudi Arabia. This end of year public conference is part of the IoE’s strong emphasis on working with international research colleagues to provide a rich research and networking environment for its PhD researchers. It gives IoE postgraduate researchers the opportunity to prepare abstracts for review, to present their work to IoE students and staff and to receive feedback from a wide range of specialists in their field. The Committee’s work on the conference with its international speakers also gives the postgraduate researchers a vital real world experience of ‘live’ research events. 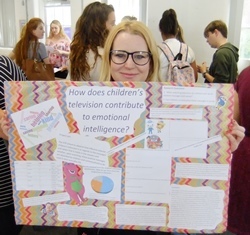 Coupled with the strength of expertise at the University of Reading in education, for which it is it ranked third in the UK in the Guardian University League Table, 2018, projects like this develop the crucial skills required to contribute incisive research to the public education arena. Trees are finally given a voice – join us today for “Treelaxation” and hear what two of our chattier trees have to say. 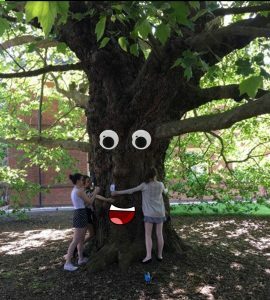 The influence of education is not confined to the humans at London Road, as our trees have finally found their voice and are set to share their views during a special Treelaxation session today, 8 June, outside Building 33 between 1.15-2 pm . The trees will be in a reflective mood as they branch off into this new venture in which they will share their stories, leaf through their poetry canon and root among their memories. If you are stressed, tired or just in need of a break, don’t be stumped – instead, join us for some treelaxation under a couple of our more chatty trees. Brought to us by NatureNurture, a dynamic local charity, that engages in using technology outdoors, this immersive installation is part of our Secondary ITE Computing Outdoors Enrichment Project. NatureNurture partnered up with The Woodland Trust and presented the Talking Trees Project successfully in London at Potters Field Park last week. Primary school children needing more support for phonics could get a welcome boost from a masterclass tour by education experts. 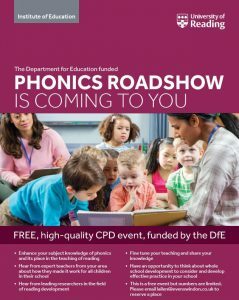 The roadshows, run by the University of Reading’s Institute of Education, are funded by the Department for Education to support authorities/districts where five and six year olds in the Year 1 phonics screening check are performing below national averages. The team will be highlighting how their research into reading development can benefit the teaching of early reading, and have worked with lead practitioners and consultants in local authorities to tailor the roadshow’s content to local needs. “We’re delighted to have been given the support from the Department of Education to work with and develop the practice of teachers of young readers. “There is a wealth of evidence that can help the teaching profession to continue to improve, and at the University of Reading’s Institute of Education we are committed to ensuring that the 400 teachers that we train each year benefit from the latest research. It’s a great privilege to be able to take this experience around the country to help teachers grow in confidence in their phonics teaching. “The government is determined to make this country work for everyone, not just the privileged few. Ensuring all primary school children can read fluently by the time they leave primary school is fundamental to this ambition. The roadshows will equip teachers and their schools to raise attainment in reading through an enhanced understanding of how research about reading can inform practice, and through the opportunity to reflect on how they can adapt what they do currently. The events start with a summary of what research says about the teaching of phonics, and then move into activities that support teachers and senior leaders in analysing their current phonics schemes and their pupil data. Later parts of the day include advice about what to do when children seem ‘stuck’ in their reading progress, and advice about the practicalities of effective phonics teaching using local expert teachers from schools where reading results are strong. Events are co-led with local authority personnel with the intention that the impact of training can be sustained after the Reading team have left. 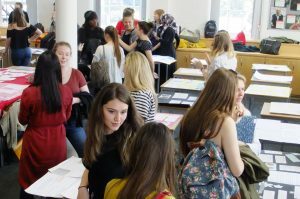 The team, which includes Dr Naomi Flynn and Dr Daisy Powell from the University of Reading’s Institute of Education and Professor Morag Stuart from UCL’s Institute of Education will be following up with schools who have attended the roadshows during the next academic year to check their performance and what further support they might need. Fantastic ATP Conference featured our talented students’ research & presentations as well as a hint of nostalgia as we waved off our class of 2017 to bright futures. 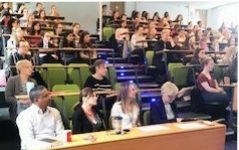 The IoE was proud to present a fantastic ATP (BA Primary Education (QTS) Advanced Teaching Project) conference at our beautiful, sun-filled London Road campus on 7 May. The conference proved, if proof were needed, what talented and innovative students we have. This annual occasion is always fun-filled, lively and above all, the culmination of a lot of hard work. It is also bittersweet as we wave goodbye and good luck to our much valued Year 3 BA Primary Education (QTS) students. They are a wonderful cohort who have contributed enormously to the work and spirit of the IoE during their years with us. 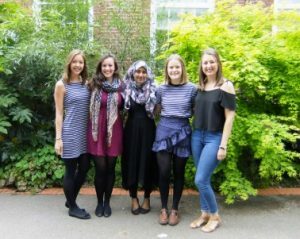 Each year, the best ATP candidate receives The Professor Rhona Stainthorp Prize for outstanding achievement in undergraduate research, with two runners up. This year, Carol Fuller was glad to present the well-earned prizes to the winner, Rosemary Lawrence for her research, “What are the perceptions of ‘teaching British Values’ within the educational community?” and the two runner ups, Aniqa Leena and Charlie Allen. 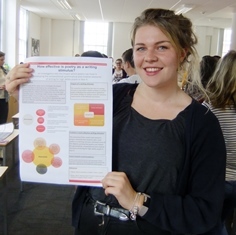 “I am so proud of the calibre of research that our students have developed. Teaching is a research embedded profession. Our students demonstrate this by the range of work they undertake for their ATPs. We benefited from our excellent key note speaker to the conference: Dr Carol Fuller, the distinguished educational researcher and Associate Professor in Education. 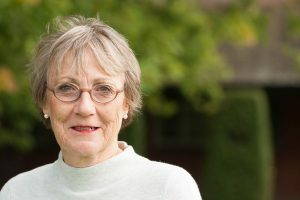 Carol is a strong advocate of learning that promotes confidence and positive educational identities so as to ensure all children achieve their full potential, regardless of their background. Hearing her dedication as she spoke was thought-provoking and stimulating. After the ceremonies, everyone was finally able to kick back and relax over a picnic, enjoying the chance to be together one more time before our much-valued Year 3 students head off into their bright futures. We are proud of our five presenting students, who did such sterling work at the conference. Congratulations to you all! A mixed methods investigation exploring mathematics self-efficacy beliefs of Year 2 boys and girls. 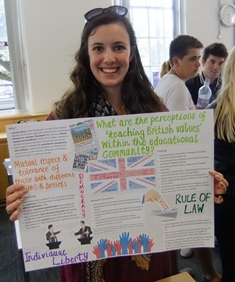 What are the perceptions of ‘teaching British Values’ within the educational community? Do traditional constructions of masculinity have an impact on boys’ achievement in literacy? The Singapore Model Method, a Help or a Hindrance to Developing a Conceptual Understanding of Mathematical Ideas in the British Primary School? This is an exciting year for all of us at the Institute of Education at the University of Reading, since we are celebrating 10 years of successfully delivering the BA (hons) in Children’s Development and Learning (BACDL). To mark the occasion, we are holding a Celebration Event for BACDL’s 10th anniversary and we would like to invite you to join us! The event will take place on Friday 30 June between 15:15 and 16:30 in L24 G06. Our Head of School, Dr Cathy Tissot as well as our Head of Early Years, Jo Elsey, and many other academics that have supported our programme over the years will be there to celebrate with us and congratulate all past and current students for their achievements. The event is free, but registration is required. Please book your place as soon as possible and latest by Saturday 10 June to help us plan for catering, since the event will be a tea party, with lots of drinks, snacks and cakes to enjoy. For more information and reg istration, please click here.